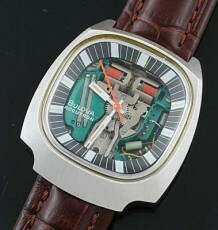 vintage Bulova Railroad approved watch with tuning fork Accutron movement. 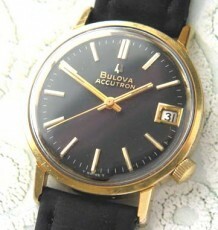 A cool vintage Bulova Accutron Railroad wristwatch. 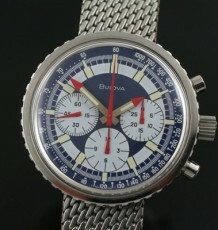 These Accutrons were really revolutionary watches for their time and nearly ran the mechanical watch industry out of town as they jump started the electronic watch craze. These Accutron 214 movements used a tuning fork powered by a battery powered coil to regulate the beat of the watch and thus producing pretty accurate time keeping. Over the years many people stopped servicing them and they have become scarce. This watch was just serviced by a certified Accutron specialist and is running incredibly well and keeping accurate time. The dial of the watch is the real attraction here. How often have you seen a Railroad grade Accutron is a steel case much less a model 214? 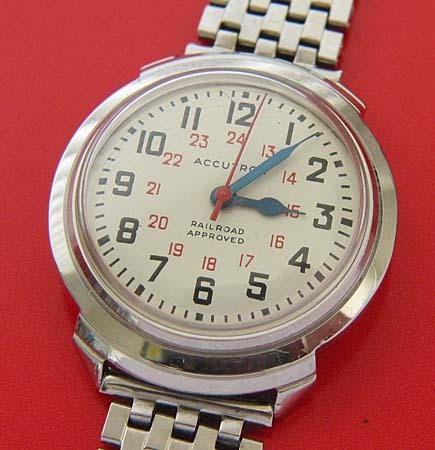 The dial is near mint and features black Arabic numerals that the 1-12 o’clock markers, however is true Railroad function, there is an inner 13-24 hour chapter in red, all pointed out with the traditional blued steel spade hands which is a tradition dating back to the days of the pocket watch. This particular watch dates to 1965 based on the alpha numeric dating system on the back and is supplied on a nifty German made steel link bracelet, which is quite comfortable on the wrist. 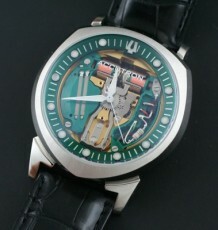 The watch measures 36 mm wide by 39 mm long.